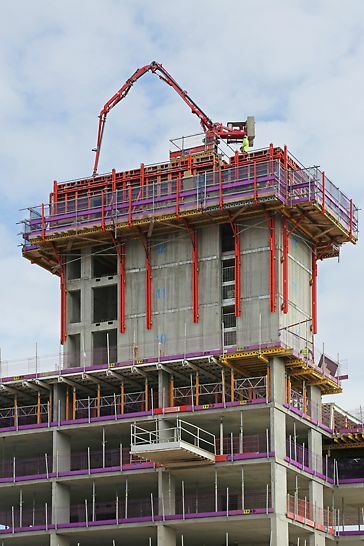 Purpose: Place a 13 m Spider boom on a platform to facilitate the concrete pour at each jump. 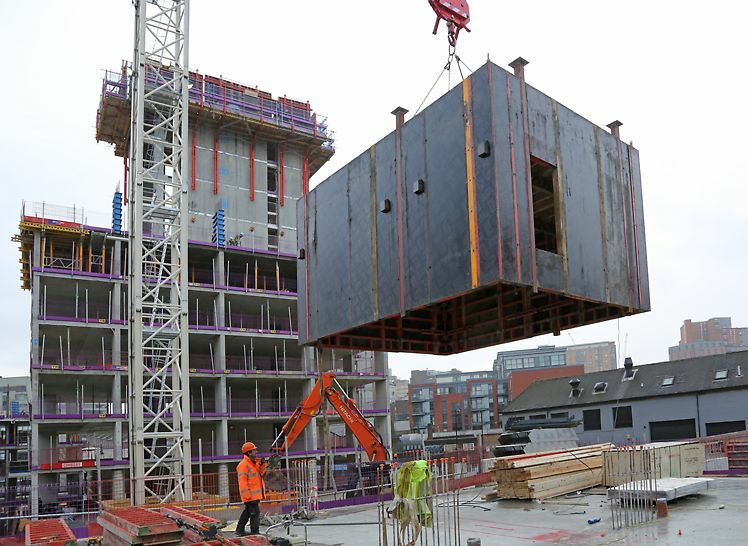 The 19-storey tower forms part of the larger Hollis Croft student housing development, approximating a total cost of £63 million. Alongside student accommodation, the development will also comprise commercial space, enhancing Sheffield’s thriving student community. Read our Hollis Croft case study for more information about this project. 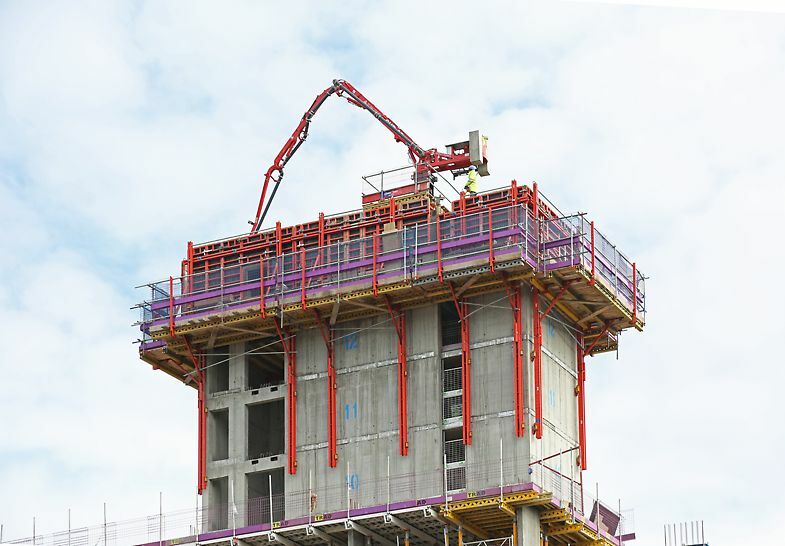 A solution was required that would enable the customer to reduce crane dependency, yet accelerate the speed of construction. With loadings of 40kN per leg, the implications of placing the Spider boom on top of the TRIO panels had to be considered, as this had never been done before. 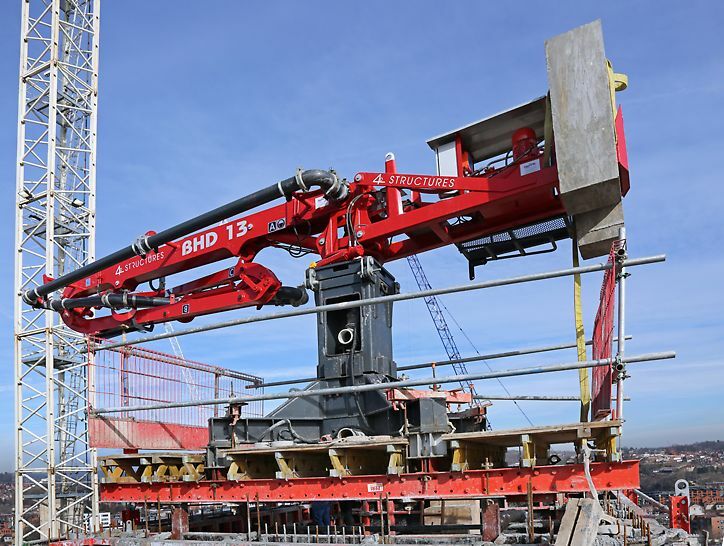 The load from the boom and platform had to be transferred elsewhere in order to reduce the impact on the formwork and for construction to be practical. The proposed idea meant that the platform would be supported by RCS, with TRIO formwork bearing the entire load of the platform as each level was concreted. Custom box steel infills were incorporated between the inner TRIO panels, which were fabricated in-house using standard off-the-shelf steel sections. By improvising with SRU walers and RCS rails from the VARIOKIT range, the need for bespoke components was reduced and costs were minimised. 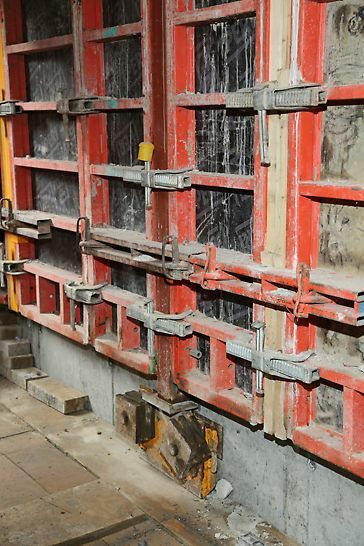 In order to enhance load-bearing capacity and guide the box steel infills, ACS Double Anchor shoes were implemented in addition to RCS climbing shoes which were cast into the concrete walls of the core. The weight of the boom and platform was distributed across each infill, transferring the load into the ACS Double Anchor shoes. A metal plate was supplied at the bottom of the infills to enable them to rest on ACS anchor plates, which bore the combined load of the boom and platform.